Hitting the stores on Black Friday? These apps can help you optimize your plunge into the retail madness. 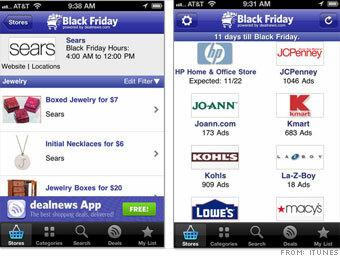 Commissioned by dealnews.com, the free Black Friday App allows you to browse both "leaked" ads and discounts featured by major retailers. Available on Android and iPhone, the app keeps you up-to-the-minute on the latest deals. Users can search for their favorite stores or browse by category. You can save deals that intrigue you to your shopping list, share deals on Facebook and Twitter, and seek out stores near you. For deals available online, the app will let you make purchases straight from your phone.